An aerial view of Culzean Castle, South Ayrshire. Bus bosses have put plans to scrap services to Culzean on hold. Stagecoach West Scotland had proposed that its No 60 Ayr-Girvan service no longer take in Culzean, instead returning to the A77 and going through Maybole to Kirkoswald. 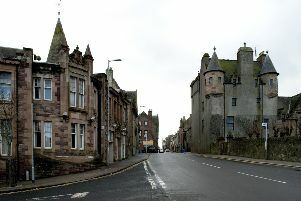 The company said that change, prompted by low passenger demand, would give many Maybole residents access to a handy bus service for the first time and also cater for residents of Alloway’s Doonholm Road and the Loaning. However, following public consultation, it has given the Culzean stop-off a stay of execution pending talks with the National Trust for Scotland over how best to cater for visitors to the castle there. Service No 60 will not be diverted via the Loaning but will continue to operate as currently, via Maybole Road to the south of Ayr. The changes to services that were agreed will take effect on Sunday, September 17, rather than Sunday, August 13, as originally proposed. Tom Bridge, managing director of Stagecoach West Scotland, said: “We need to provide services that reflect current travel patterns and are sustainable, allowing us to invest in our employees and vehicles. “Throughout the consultation period, we have had a number of comments asking us to leave services as they are or, indeed, to increase service provision. However, this is simply not a realistic option. “We have made a number of amendments to our proposals based on feedback during the consultation period, a number of which will not be sustainable in the longer term if we do not see improved passenger numbers and action from relevant authorities on congestion and better bus priority measures. “Our staff work extremely hard every day to provide good-quality services to our passengers. “However, we must have viable services and, as such, we encourage people to support their local bus services to ensure that they can continue to operate. The No 58 Ayr-Girvan service will now operate via the former’s High Street on inbound journeys as well as via the Loaning. Service No 8 from the Loaning to Burns Statue Square in Ayr will be withdrawn and replaced by an hourly stop by No 58 buses now operating, between 9am and 5.30pm, via Ayr High Street. The No 1 route serving Hillfoot in Ayr will remain on a 30-minute frequency but will take in the Masonhill terminus. Between 9am and 6pm, it will go via St Andrews Street, Glencairn Road, Hillfoot Road, Masonhill, Clarendon Place and Caledonia Road. Morning and evening journeys will go via Ashgrove Street, not St Andrews Street. Evening journeys will not serve Masonhill.